WildC.A.T.S. (1994) : Série TV de 1 saisons et 13 épisodes diffusée sur . Casting, acteurs, bandes annonces et actualités. Casting de la série "WildC.A.T.S." S01E01 Dark Blade Falling 01/10/1994 The WildC.A.T.S. are introduced as they attempt to recruit the member of their team, Reno Bryce, the computer expert and unwitting descendant of the Kherubim. But the Daemonites are after Reno as well. S01E02 Heart of Steel 08/10/1994 Helspont sends the Troika to retrieve valuable computer information revealing the location of a top-secret fusion plant. The Troika successfully steal the information, but the resulting battle with the WildC.A.T.S. bring Spartan face-to-face with computer expert Karyn, an old flame from when he was flesh-and-blood. S01E03 Cry of the Coda 15/10/1994 The WildC.A.T.S. move to stop Helspont, but he has an ace up his flaming sleeve. The Coda, a secret organization of warrior women created by Zealot, have turned mercenary and are now working for the Daemonites. S01E04 The Evil Within 29/10/1994 Helspont needs a special government spy satellite in order to resume his quest for the Orb. In order to take control of the space program, he has the President of the United States possessed by a Daemonite. S01E05 The Big Takedown 12/11/1994 A Daemonite break-in at Halo Optical leads Marlowe to believe they need more security and Grifter knows the man for the job - an ex-accomplice trained by Grifter himself named Lonely. S01E06 Lives in the Balance 19/11/1994 A Kherubim stasis pod crashes on Earth after orbiting for thousands of years. It opens to reveal Majestyk, the Kherubim leader who assumes command of the WildC.A.T.S..
S01E07 Soul of a Giant 26/11/1994 Eons ago, the Kherubim Elders left clues to the location and use of the Orb on an onyx tablet. Helspont hires an archeologist to find the tablet who is none other than Professor Stone - Maul's father. S01E08 Betrayed 03/12/1994 Warblade attends a martial arts contest in Japan. Meanwhile, a Daemonite psionic transmitter implanted in Marlowe forces him to crash the WildC.A.T.S. aircraft in Tibet. S01E09 Black Razor's Edge 10/12/1994 Helspont now knows that the Orb is buried deep within Samosir Island, located in a Sumatran lake. However, in order to reach it, he needs a powerful digging device - the government's newly developed anti-missile laser. S01E10 And Then There Were None 17/12/1994 The Daemonites obtain an abundance of concussion bombs from an oil company and set to work unearthing the Temple where the Orb is hidden. However, the WildC.A.T.S. have discovered the location as well. S01E11 M.V.P. 07/01/1995 Marlowe has purchased Samosir Island and surrounded it with armament to keep Helspont away. Helspont is determined to attack the temple again, but first ensure the WildC.A.T.S. are unable to stop him. S01E12 The End Game (1) 14/01/1995 The Daemonites attack a NASA research facility to obtain an anti-gravity device that will allow the Behemoth to fly again. The WildC.A.T.S. arrive to battle them, but discover they were set up. S01E13 The End Game (2) 21/01/1995 With the aid of the anti-gravity device, the Behemoth will, and its guns will quickly blast out the Orb. 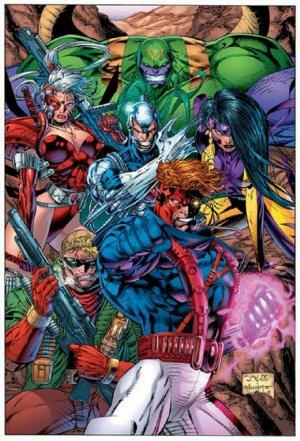 The WildC.A.T.S. must get the Orb first and use its power against Helspont. Envie de parler de WildC.A.T.S. ? Les discussions sont là pour vous. Retrouvez toutes les informations sur WildC.A.T.S. lancée en 1994 : synopsys, casting complet, acteurs, scénariste, réalisateur. Découvrez des séries similaires à regarder également. Faites vous une idée de la série grâce à la note des membres et aux critiques des internautes.